On 20 February 2019, Griffith University hosted a wonderful farewell event for me (organised by a highly efficient team led by Executive Assistant Sheila Twilley and Institute Manager Ian Hayward – thank you!). The farewell acknowledged my three years as Director of the Griffith Institute for Drug Discovery and celebrated my new appointment at the University of Wollongong where I will be Deputy Vice-Chancellor Research and Innovation. I was asked to prepare a 2-minute speech for the event. Below is the transcript of that speech. There‘s a well-known African proverb “It takes a village to raise a child“. Well, it took many villages to raise this Director, including all of you in this room, as well as many others who couldn’t be here today. I want to thank each and every one of you. Not least for taking time out of very busy lives, to come here today and celebrate all that we have achieved together. Without you, without your help, support and advice we could not begin to realise our goals, our dreams. Together, we have accomplished so much in just three years. But first, I should let you know that I’ve been banned from thanking each of you individually, so please also know that “my success is your success ……and your success is my success”. I thank you for your success. And I thank you for my success. Second, I am deeply grateful to Griffith University for the opportunity to lead the remarkable Griffith Institute for Drug Discovery (aka GRIDD), and to work with so many incredibly talented and dedicated researchers, professional staff and students. Obviously I am sad to leave: I care very deeply about GRIDD and the people who joined me on this journey on March 1 2016, a journey that started out by defining our mission and our purpose “Creating knowledge that transforms lives” and our values (ie how we put our purpose into action). I am so proud that we are a values-based research Institute, an Institute that cares about, that exemplifies, that rewards excellence, integrity, respect and collegiality. And, as somewhat of an aside, there is something quite beautiful about the symmetry of my Griffith start and end dates (1 March 2016 – 1 March 2019) that brings a certain sense of crystallographic joy. When I step aside in a few days time, there’s no need for me to be concerned about GRIDD because I know it will be in the excellent and highly capable hands of Prof Kathy Andrews as Acting Director and Prof Sally-Ann Poulsen as Acting Deputy Director. My own research team will remain at GRIDD and I will have the pleasure and privilege of co-leading that team with Dr Maria Halili. We will become the Halili-Martin lab. That news makes me very happy….because it means I get to continue to work with a fantastic research group in a wonderful Institute, and it means I’ll be back at GRIDD regularly! (you can’t get rid of me that easily). You may wonder then, if I am so sad at leaving, why am I going? The thing is, I have an ulterior motive. You see, at my core, I am an idealist. I am a dreamer. Africa’s First Woman President, and 2011 Nobel Peace Prize recipient, Ellen Johnson Sirleaf is also a dreamer. She said “If your dreams don’t scare you, they aren’t big enough”. And she’s right. My dream certainly scares me. My dream is to change the world; particularly that part of the world that focuses on how higher ed research is measured and valued. I want researchers to be valued for more than the number of dollars they bring in, the number of papers they publish, the number of HDR students they supervise. I want researchers to also be measured by their values and how they live them; by how they treat other people; by how those at the top support those still climbing the ladder; by how they help underrepresented minorities to succeed; by how they mentor people from outside their own demographic, outside their own team, outside their own organisation. By how they build community. Most of all I want to help young people achieve their own dreams, whatever path they choose to carve. According to Eleanor Roosevelt, well-known US diplomat and activist, “For our own success to be real, it must contribute to the success of others.” And you know what, that is how I want to be remembered: as someone who used the recognition they’ve been fortunate to receive, the connections they’ve made, and the unearned privilege that society has afforded them, to change the world for the better – to help others succeed, to smash stereotypes and disrupt the status quo. Some of you may know that I have always adored cats. Perhaps that is most glaringly obvious from the number of cat videos I share on social media. Did you know that managing academics has been likened to (shares cat video) herding cats*. That simple observation may go some way to explain why it is that I love the challenges and opportunities of academia so much. I’m a woman. And I was raised a Catholic. So I know a bit about guilt and shame. One of the earliest and most confusing lessons I learned was, it doesn’t do to show how clever you are. That would be shameful. Boys don’t like girls who are smarter than them. This old “girls are not (meant to be) smarter than boys” cliché may contribute to the bias many of us hold that science is male. It may explain why, for example, when I’ve received a prestigious speaking invitation, a leadership role, fellowship, award, whatever – I’ve often also received a comment or two implying that I’d only got that gig because I’m a woman. You know quotas. Affirmative action. The subtle message is that I couldn’t have earned it on merit alone – consequently there must be more deserving men who missed out. Presumably, I should be ashamed. Speaking of affirmative action, people of all persuasions have told me they don’t support quotas or targets to address entrenched gender imbalance. That wouldn’t be fair to men. Women will feel uncomfortable. No, we must consider merit only. We can’t let this issue affect quality. Hmm, I think…but increasing diversity will affect quality; it is bound to improve. Anyway, who made up the rules so that merit means pale, male, and stale? Look around. Look at every sphere of influence, every sector, every decision-making body. There is already a quota system in place. It’s a quota for men. Men are supported by societal constructs, by systems, structures and policies devised by men for men. Systems and constructs that we all adhere to, unconsciously or otherwise. I am reminded of an infamous conference in 2015 in a field of science replete with high profile women. A conference with 21 invited speakers. Three of those invited speakers were men named Mark from NSW. Yet none of the 21 invited speakers were women. Not one. The conference website proudly displayed the headshots of the invited speakers. It was magnificent in its uniformity. How could the organisers not see this enormous carbuncle of a problem? Did this conference have no shame? Did they expect that no one would comment? Did anyone tell those invited men that they only got that gig cos they were men (named Mark from NSW)? Do you think it entered their heads that because of an insidious unconscious quota system for old white men, they had benefited from invisible privilege? Did they consider that in accepting that quota, I mean invitation, they had taken the place of a meritorious woman? Some men are horrified when they find out – and are quick to respond. Others. Well, clearly they must be the best speakers because they wouldn’t have been invited otherwise. That’s how they got that gig. They earned it. What’s more, I should be ashamed for asking such questions and making them feel uncomfortable. It’s an awkward truth, but this is what entitlement looks like. Guess what? It’s not that difficult to get quality and equality in speaker lists for conferences or panels. I’ve done it many times. The trick is to be aware that implicit bias exists, to consciously address it, to plan ahead and, you know, maybe count the number of women and men you invite. I wrote a post – a how-to guide if you will – to help others achieve conference speaker gender balance. I published it in PLOS Comp Biol in Nov 2014 with the title “Ten simple rules to achieve conference speaker gender balance”. It’s been viewed over 35,000 times. Ten simple rules. 35,000 views. And yet conference organisers still mess up. So, more than a year ago I wrote another 5 rules, to provide remedial help. You can see what I’m doing here, I am trying to be polite. I am trying to help. That’s what is expected of women. It’s more than four years since I wrote that original post. Over three years since the open-access paper was published. And yet we still end up with conferences like this and this and this (scroll down to see the list of speakers) and this. Some of the men who accepted to speak have signed a #panelpledge. They should be ashamed. Women I’ve never met contact me on a regular basis, women who are ashamed of their professional society, their organising committee, their field, which has – without any apparent shred of shame or guilt or self-awareness – approved and happily advertised a panel, or conference speaker list with no (or very few) women. How is this acceptable? It’s not acceptable. I’ve had enough. Now, I have no shame. Our world can’t wait another 200 years or more for equality. So on this International Women’s Day 2018 I will #pressforprogress by pledging to out conferences, panels, societies that have no obvious regard for equality, and to shame men I know that accept speaking invitations without considering diversity and who thereby contribute to normalising this persistent abnormality. This is really important. Not just for conferences. For our future. If we are to solve the many challenging problems our world faces, we need to make sure that everyone has the same opportunities to succeed, that there is a level playing field, so that we really do end up with the most meritorious people in positions of power, making the big decisions. Join me to #pressforprogress. Post those #allmalepanels you see advertised, here. And ask questions, like: before I join, what is this society’s speaker policy? why aren’t there any women on the invited speaker list? Inclusiveness and diversity are key to future success, so why should I pay to listen to a panel that isn’t inclusive or diverse? You never know, we might just change the world one shame at a time. Actually, this post has nothing to do with Seattle. I just liked the title. The theme, eventually, is science leadership through altruism. But to get there, first I need to relate a story that has been on my mind the past week or two. It’s a story about my highest cited paper. Which happens to be a single author paper. Yet this paper almost didn’t get submitted. According to Google Scholar (2 Jan 2017) this paper has 785 citations (579 according to the journal). And though it’s more than 20 years old, it still averages 30 cites per year. The paper reports on a protein fold that has been used in Nature to deliver many different enzymatic functions, and in so doing has evolved the most incredible and beautiful diversity of protein architectures. It is a most enchanting protein fold. (I may be biased). Sure, after 20 years the paper is probably in need of an update. But as you might imagine, I am inordinately proud of this piece of work. Especially given that at the time I wrote it, I almost talked myself out of submitting it. Funny how things work out, isn’t it. A few years before that paper was published, I solved the crystal structure of a then recently discovered bacterial protein (DsbA) that had no detectable sequence relationship to any proteins of known structure. That information implied that its structure would be completely novel. At the time, I was a postdoctoral researcher at Rockefeller University. The structure determination was challenging, for a number of reasons that I won’t bore you with. Suffice to say that it required some pretty nifty labwork to wrangle the structure out of that crystal. 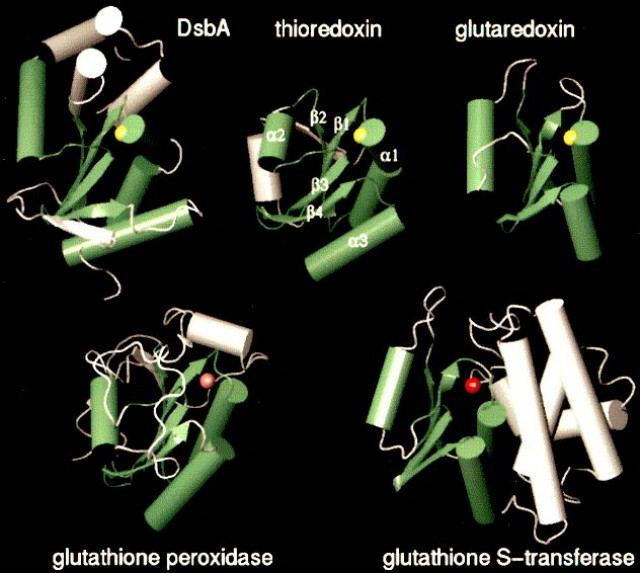 The important point is that to everyone’s surprise, despite the lack of sequence similarity, the structure revealed that my protein was related to an already characterised protein (thioredoxin). Unexpectedly we had found distant protein cousins – but it wasn’t their DNA that gave their relationship away, it was their shape. Then came the spanner in the works. John insisted that this structural bioinformatics paper was mine; and that he should not be an author. After John took his name off the paper, the other co-author followed suit. Eek. I was on my own. As a new lab head I had sort of been relying on these two to help me write the cover letter, respond to reviewers’ comments. And, you know, give the paper some cachet. Now, the cachet would be left entirely to me. My first reaction when the two co-authors jumped ship was that they must think the paper was a dud. Such is impostor syndrome thinking. But needs must – I hadn’t had any papers published for 18 months because of the move to Australia and setting up a lab. So I timidly submitted the paper to a good journal and – surprise, surprise – it was sent out for review. The reviewers were supportive. The paper was accepted with minor changes and then published. The rest, as they say, is history. • I am reminded of Prof Ben Barres of Stanford University. On that last point, I was deeply shocked and saddened by the news that Ben passed away recently. Ben – a renowned neuroscientist – had a unique perspective on equity and diversity. He was openly transexual. In a 2006 commentary he told the story of how, soon after transitioning, he overheard a colleague say “Ben Barres gave a great seminar today, but then his work is much better than his sister’s”. I never met Ben, but I felt I had. He was inspirational, a champion of those marginalised in academia. He spoke truth to power. Ben believed so deeply on the importance of this point that he wrote an opinion piece in Nature published in August 2017 while “dying of stage four pancreatic cancer“. He argued that lab heads should let junior researchers take their projects with them when they start their own labs because it drives innovation and discovery. That’s what he did for his team. And JK did for me. So how about it research agencies and organisations? Let’s incentivise innovation. Enable altruism. Support real leadership in science. Metrics for selflessness now! It’s been quite a while since I posted here. Last time was just after my mum passed away. Since then, I’ve had to get used to a whole new world without my longest-standing ally and confidante. Mum even followed my blog, bless her. It’s been tough, there’s no doubt about it. Not a day has gone by that I haven’t shed a tear. I miss her enormously. But life goes on, as my dear old mum would say. Now I can even laugh when I think of her, and how she would be whooping it up this weekend, dancing a jig and waving her Tigers scarf to celebrate the Richmond AFL Grand Final win after 37 years. And I can recognise how incredibly lucky I was to have such a remarkable person and amazing role model in my life and on my side. Her story is inspirational to me. It’s all the more incredible knowing what mum went through, and the personal sacrifices she made, to achieve her number one goal: providing a safe and supportive home for her family. She succeeded against the odds. She never gave up, despite many, many disappointments. She picked herself up, dusted herself off, and tried and tried again every time life knocked her down. Seeing her tenacity, her persistence and determination to learn from failures was a lesson in itself. I couldn’t have carved my own path without understanding that aiming high will always lead to disappointment, and that for the most part no-one else sees those failures. Importantly, the lessons learned from trying and failing can provide a springboard to future success. And so it is that I come to the topic of this post. My own shadow CV – the CV of failures and rejections (see a summary of others here). Scientific studies generating positive results are more likely to be published, and negative results are hardly ever published – giving rise to publication bias that skews science and its progress. It’s the same with CVs – reporting only positive outcomes skews the perception of what it takes to progress in academia. • As an undergraduate I was accepted into a BPharm degree, but my CV doesn’t say that I was rejected from Vet Sci and Medicine (x2). Yep, BPharm was my fourth choice. • As a postgraduate, I was awarded a Royal Commission for the Exhibition of 1851 Science Research Scholarship, but my CV doesn’t record that I was rejected from dozens of other schemes before that one was awarded, including the Rhodes and Kobe Scholarships. • As a postdoctoral scientist I was accepted into Rockefeller University as a Research Fellow, but only after I was retrenched from my first postdoctoral position barely six months after starting at Bond University. So ashamed of this episode was I, that I didn’t include it in my CV for many years. • After returning to Australia from Rockefeller University, I set up my independent lab at the University of Queensland, with my salary funded by an ARC Queen Elizabeth II Fellowship. What my CV doesn’t indicate is that I was on the reserve list for that Fellowship, and only got through because someone else did not accept their award. I often wonder who that was, why they didn’t take it up, where they ended up….whoever you are, thank you! • Yes, I was fortunate to be awarded that Fellowship, but not so fortunate with my first grant. Rejection, rejection, rejection. Not recorded in my CV. • Without funding for anyone but myself, I was the only person working in my lab. It was a group of one! That detail is not recorded in my CV. Research outcomes were slow and papers even slower. It took two years for the first paper to be published from my independent lab. • Speaking of papers, my highlight CV records that a paper from my lab was recently published in Nature Communications. Yay. What is not documented is that the process from first submission to publication took over two years, including rejections from three other journals, and an initial editorial rejection from this journal. (Yes, I know, I need to start submitting preprints). • Then there are the award nominations that never got anywhere. Too many to mention. But what I will mention is the three last year for which I was a finalist, but not the eventual winner when the envelope was opened. So close, but no chocolate cigar (I don’t smoke). What to do when this happens? Join in the fun and celebrate with the winner; life is too short to spend it being miserable. And as my dear old mum would always say, if it weren’t for the bad times, the good times would not feel nearly as good. *Turns out this title was somewhat prophetic. I came up with the title and began writing the post a few weeks ago whilst on holidays. The day after I started, I suffered a detached retina – a medical emergency – that was evident as a shadow descending across the vision of my left eye. This post is the text of the eulogy I gave at my mum’s funeral, and a poem chosen and read by my sister Cathy at mum’s burial. 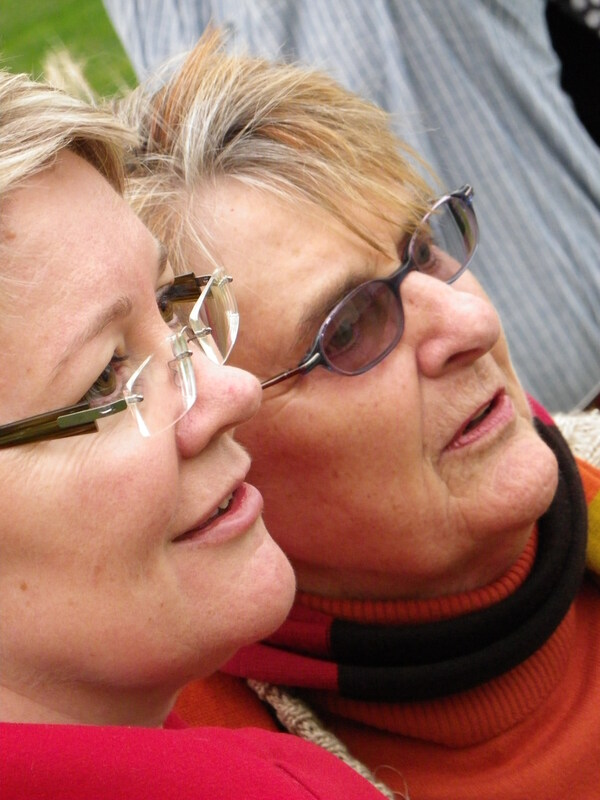 Mum was an incredible person and a wonderful, inspirational role model. We love you mum and will miss you very much. Thank you for everything. “Some people make things happen, some people watch things happen and some people wonder what happened” to paraphrase Jim Lovell, Apollo 13 astronaut. Judith Mary Martin – whose life we celebrate today – unquestionably falls into the category of people who made things happen. Mum may not have flown to the moon, but she most certainly reached for the stars. Born in 1934 in country Victoria, Judy had an older sister Faye, and a twin sister Joy. When still a little girl, her parents separated, and she moved with her mum and two sisters to Melbourne. It was the middle of the depression era: they lived in abject poverty, surviving on bread & dripping at times, doing midnight runners to avoid paying rent, and going to the pawnbrokers to get items out of hock when her mum – a factory worker – got paid. As a young girl, mum had already decided she would never work in a factory; she would get educated, work hard, and make sure that her family would have a stable and loving home life. She achieved all that and much more, despite seemingly insurmountable obstacles. Having to leave school at grade 8 – aged 14 – wasn’t a great start. Mum’s first job was at the Imperial War Graves Commission, but she really wasn’t cut out for office work. She toyed with the idea of becoming a nun, but in the end chose nursing as her vocation. Once the decision was made, she then made it happen. Trouble was, nursing training couldn’t begin till she was 18, and mum was just 16. So she hounded the nursing director till she got a job as a probationer and then after significantly more hounding, she entered nursing training at the tender age of 17 years and 5 months. She was in her element, she loved the work, and she loved the girls she worked with. She said that those years were the best of her life, the most carefree, and loads of fun. 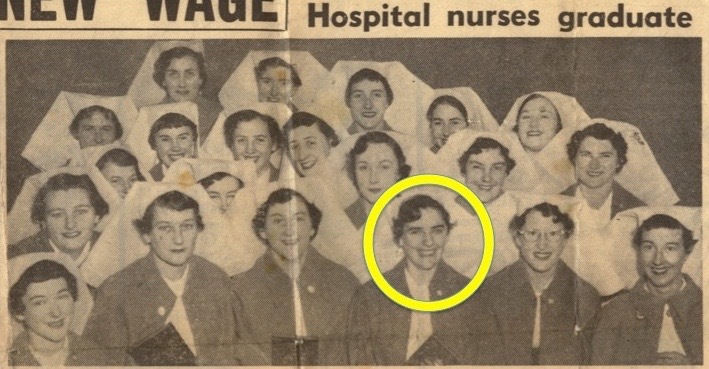 She worked hard, was determined to succeed, and eventually became Nurse Unit Manager (Charge Nurse) of the entire operating theatre department at a major Victorian Hospital. Although she left school at 14, she returned to study part-time aged 52, first to complete her VCE and then to graduate with a Bachelor of Nursing in 1992 aged 58; all the while working, and caring for her youngest children. She was still working two nights a week at the age of 72. Life was anything but plain sailing. Two weeks after she started as a nursing probationer, her adored father died – he was 42 and she just 16; still a child. Mum married twice, had 10 children and 8 grandchildren. For much of the early years, there was very little money, and life was a constant struggle. By mum’s account, her first marriage was very unhappy and didn’t last long. In her second marriage, it was mum that mostly set the family goals, she who made things happen to achieve her aspirations. She orchestrated family moves upward, including from a “hovel” to a housing commission home (the “lap of luxury”) in country Victoria, by literally begging the local MP who she collared at a school function. She also triggered a later move by reporting the house we lived in to the local council, who swiftly condemned it as unfit to live in. “I just hope someone remembers to make the school lunches”. Perhaps it was the Ernie Sigley trip that started the travel bug: she began taking road trips with youngest children Jan and Cally – to the Great Ocean Road, Adelaide, Sydney. She took her first overseas trip when she was 47, with Cathy to visit Tony and Olga and grandson Eann in Israel and then on to Italy and the UK. Because she was going to be away such a long time, she left us a long list of things to do. Including a fire drill every evening. Which we promptly ignored. 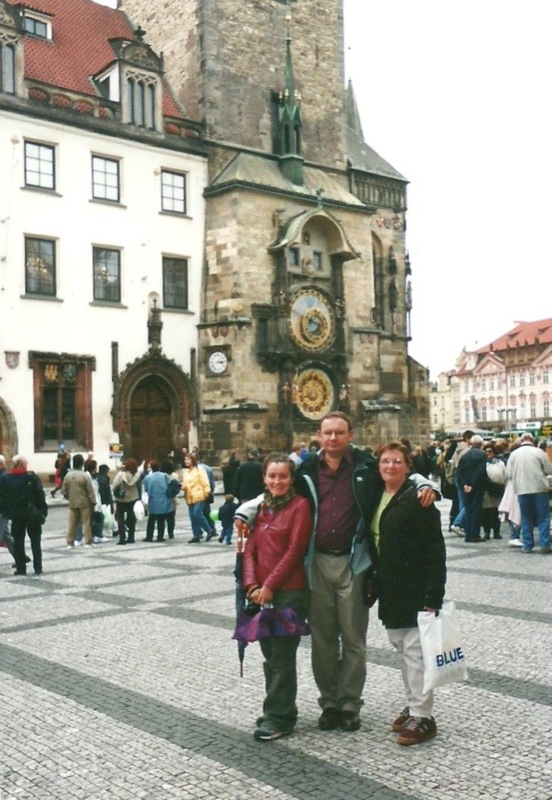 Mum took to the jetset life with gusto, soaking up history and cultures, and traveling around the world into her 70s. On one notable occasion, and despite family misgivings, mum set off to Bangkok, by herself, just after 9/11 – aged 67. She was on her way to visit Ian and Cally in London, and nothing was going to stop her from doing that. One of her greatest delights was creating things for others. After knitting her first jumper at age 11, the knitting needles hardly ever stopped. Look at any family photo from the 60s through to the 80s, and you’ll inevitably see kids sporting mum’s handmade knits. She was a prolific letter-writer too. Seeing her beautiful handwriting on a newly arrived envelope when you were far from home, was certain to lift the spirits – with family news, photos and mum’s life advice. 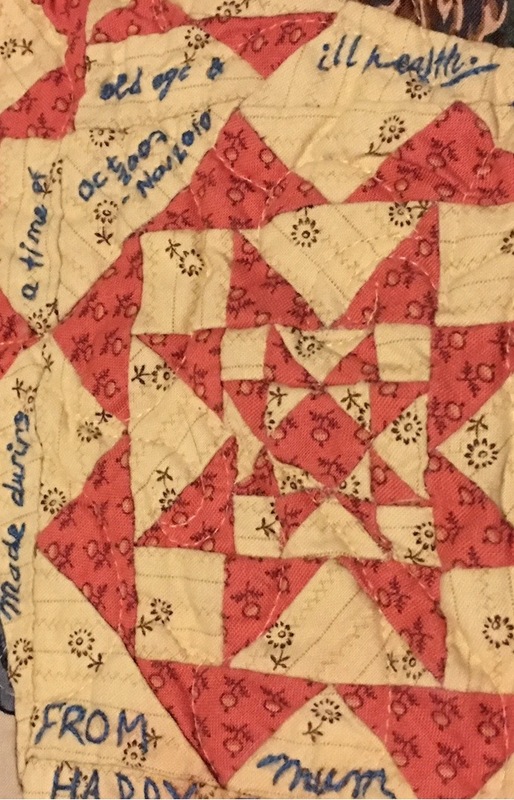 In the 1990s, mum discovered patchwork quilting after a visit to an Amish Village in the USA. 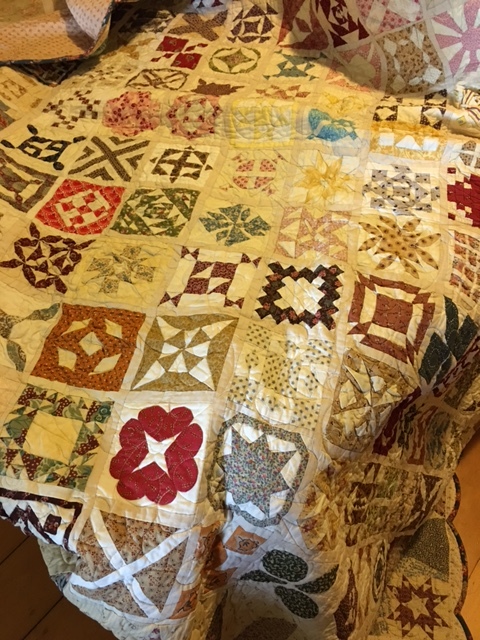 She created over 100 exquisite quilts, that are now our treasured heirlooms. 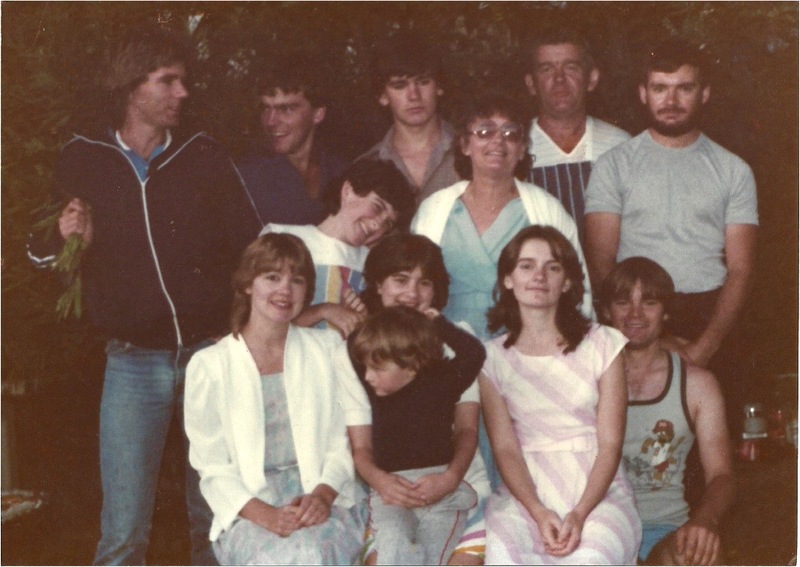 Mum didn’t just create tangible things like jumpers, letters and quilts, she also created intangibles – memories, moments, merriment – especially around celebrations of birthdays, Easter, and Christmas. She truly cared about people, and she enjoyed having a bit of fun too! She loved movies and music, and would sing or dance at the drop of a hat. Coming from good Irish stock, Mum had a fine sense of the absurd. When Tony Abbott announced that he was bringing back Knights and Dames, mum’s planned morning tea morphed into a Royal Tea Party and she crowned herself Lady Muck of …… Some years before, she came to my New York–themed fancy dress party in QLD when I was about to leave for America. There was King Kong, Crocodile Dundee, several movie stars, and as guest of honour I was Madonna. Much to my embarrassment, the guest-of-honour’s mother turned up as a New York bag lady. Oh how she laughed remembering that story recently! Going back even further, when we as kids would ask how old she would be on an upcoming birthday, it would always be 29. Or 28. Or 25. When mum first let me know a few years ago that she wanted me to give the eulogy at her funeral, I wondered if there was anything particular she wanted me to say. Mum simply said: “Don’t sugarcoat it; just tell it like it is”. 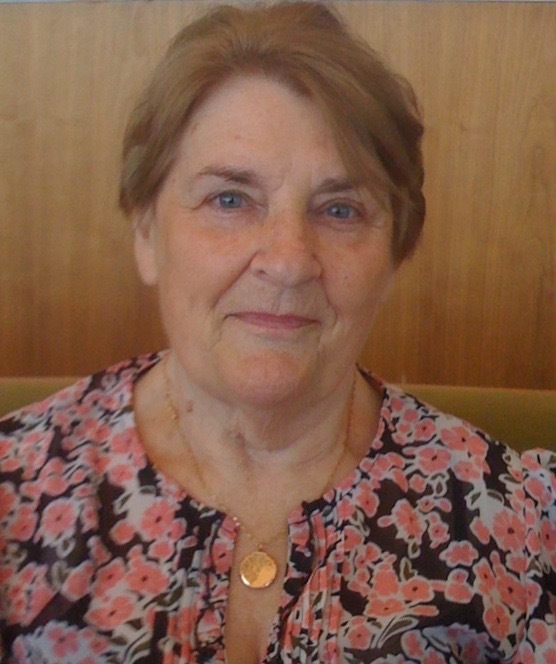 Always fiercely independent, after succumbing to side-effects of treatment for multiple myeloma, mum had to let go, to allow her children to arrange her affairs, chauffeur her, take her to appointments, feed and look after her, as she had done singlehandedly for all of us so many years ago. What she didn’t seem to understand was that far from being a burden, doing these things for her was a privilege and an honour. Looking after each other – well you taught us that mum, that is what families are for. Well, mum, you successfully navigated that minefield. Your death was the way you wanted it, peaceful, quick and not coinciding with a family birthday. You were ready to go, even if we weren’t ready for you to leave. We will be reminded of you every day by the simple things you always loved: a Richmond scarf, a cake stall, a flower garden, an old movie, a cup of tea with sympathy. Personally, I will treasure the times we spent together recently, especially our last day – when you laughed over taking selfies. How many other 82 year olds have an iPhone, I ask you? Mum, I will never forget that it was you who inspired me to reach for the stars, you who put that first precious sprinkle of stardust into each of your children’s hands, so that we too could aspire to be people who make things happen. Do not shed tears when I have gone but smile instead because I have lived. Do not shut your eyes and pray to God that I’ll come back but open your eyes and see all that I have left behind. I know your heart will be empty because you cannot see me but still I want you to be full of the love we shared. You can turn your back on tomorrow and live only for yesterday or you can be happy for tomorrow because of what happened between us yesterday. You can remember me and grieve that I have gone or you can cherish my memory and let it live on. You can cry and lose yourself, become distraught and turn your back on the world or you can do what I want – smile, wipe away the tears, learn to love again and go on. My beautiful, beloved mum passed away. I owe her everything and will miss her terribly. In 2006 I gave a graduation speech at the University of Queensland, inspired by her life lessons. The text of that speech, is given below. I hope to post more about this extraordinary woman over the next week. I am *delighted* to be the first to congratulate our new graduates – so congratulations – you’ve made it, *well done* everyone. Your hard work over the past few years has now been rewarded with the conferral of a degree in Science, and you, your friends and family deserve to be enormously proud of your achievements. Today is a day to celebrate those achievements and I trust that each of you *will* celebrate in an appropriate manner this evening and that this day will be one to remember for the rest of your life! I certainly remember my graduation day when I wore this gown for the first time 16 years ago. This beautiful scarlet and peacock number is an Oxford University Doctor of Philosophy gown! I’d like to tell you how an Australian girl came to be studying at Oxford for a postgraduate degree. After completing a pharmacy degree in Melbourne and doing well at the course, I made up my mind that I wanted to further my study overseas, by doing a PhD¹ at the University of Oxford. I knew that achieving this dream would be difficult, since it would require obtaining a competitive scholarship to fund my studies. But I did have a backup plan (and it’s always good to have a backup plan). In the case of no scholarship I would travel overseas anyway on a working holiday. I applied for any scholarship for which I was eligible, probably about 25 over the 12 months. Initially, I received rejection after rejection. But this just made me more determined, and it also meant that my applications became more polished at each round. Finally, on the day I was at the airport, literally boarding the plane to take me overseas, I received a phone call from the Dean of the Pharmacy College in Melbourne to let me know that I had received a scholarship to go to Oxford. The evidence that I duly completed the PhD is here before you now. The message here is, to achieve your dreams requires focus and determination. Or in the words of my dear old mum – Never give up! You will have found during your study and research for your degrees, that it always looks much easier than it actually is. There are hurdles to jump, obstacles to remove and often your own demons to overcome – these trials and tribulations generally go unnoticed by friends and family who do not see the hard work and toil that you put in. It was no different for me. After I was awarded a PhD from Oxford, you would think it would be plain sailing. I returned to Australia in 1990 to the science and technology school at Bond University on the Gold Coast. Some of you will be saying “there isn’t a science and technology school at Bond Uni”. That’s correct, it was closed three months after I arrived. I was absolutely devastated. A PhD from Oxford and I was unemployed. But I used this situation as an opportunity to develop my career further, by taking a position at very short notice at Rockefeller University in New York, a city that (to be honest) I would never have chosen to live in except that I was in such dire circumstances. This turned out to be a great career move and I subsequently returned to Queensland in 1993 to establish my own lab here at UQ. The point I’d like to make is that even when life and circumstance get in the way of your goals, you can sometimes turn these obstacles into opportunities. Or in the words of my dear old mum, when one door closes, another opens. Now that you have a tertiary degree in science, whether it be Bachelor, Master or PhD, you will have many opportunities opening up to you – because you are now part of what is being termed the innovation economy, or the knowledge economy. Knowledge and innovation are the new currency in world economics. You are the unit of that currency and it will be up to you to apply your knowledge and to derive a better future for yourself, your family, your country, your world. We have the opportunity to shape a better world by addressing the big issues – improved quality of life and developing a sustainable environment. A science degree also brings with it responsibilities. It is our responsibility to work ethically, to inform scientific debate, to mentor younger scientists and to raise awareness of science and technology among the general public. A major concern in science is the role of women. You will have seen today that around 50% of our graduates are women. Our University medallists are women. Our valedictorian is a woman. But if you look through our hierarchy or any hierarchy whether it be science, academia, industry or government the percentage of women reduces at each level so that by the time we get to the top of the tree the percentage of women is around 10%. This is a vexing issue. We are losing half of our most brilliant people. In a report that was tabled earlier this year, The US National Academy of Sciences said that in an era of global competition we simply cannot afford “such underuse of precious human capital.” They found that American women in science and engineering are hindered not by lack of ability but by bias and “outmoded institutional structures”. My challenge to you – both men and women – is to ensure that this situation changes, so that when you are my age there will be no such anomaly. This will surely require all your knowledge and innovation. Or as my dear old mum would say, two heads are better than one. I would like to leave you with a final word of advice from my most inspirational role model, my dear old mum. Unlike you or I, my mother did not have the opportunity to undertake tertiary study. In fact, she didn’t even finish high school. She left school at grade 8 to go to work. After a year or so, she was accepted into a hospital to undertake nursing (one of the few professions available to women in those days). She worked her way up the ranks through sheer force of will and determination to be charge nurse in surgery in a major hospital in Victoria. In the meantime, she married, had nine children², and supported this family by working night shifts. She is now 72 and continues to work two nights a week in surgery. My mother is a genuine role model. She never gives up, she always maintains a positive attitude and she takes no nonsense from anyone, including surgeons! She has succeeded against the odds. Her advice to us when we were growing up was “Reach for the stars – you never know what you’ll pick up on the way down”. It has certainly worked for us, with 12 tertiary degrees between the nine of us and high profile positions in academia, investment banking, IT and government. So my final words are to encourage you to take my mother’s advice, and aim high! A couple of years ago I wrote a post (show me the policy) on the gender inequity of invited speakers at conferences I’d attended, and provided ideas on how to address this insidious problem. The post was well received (as of 8 Dec 2016, >2,500 views). And after some prompting from twitter buddies (thank you) the post was developed as a manuscript, and reviewed and published in PLoS Comp Biol (ten simple rules to achieve conference speaker gender balance). That paper has been viewed nearly 25,000 times. I’ve since been contacted by many people to thank me for providing practical suggestions that can be sent to decision-makers on conference and seminar series panels. Since I wrote that post, I’ve been program chair on a couple of conferences and have relatively easily achieved 35-50% invited women speakers. I have also attempted, reasonably successfully, to give speaking opportunities to minorities and ECRs/MCRs. The feedback has been overwhelmingly positive on the quality of the programs. I sit here at the end of 2016, wondering how it is that every week I am contacted by someone around the world asking for help on this issue. People point me to conference websites with long lists of invited vanilla men. Or even more annoyingly very long lists of invited speakers from all parts of the world, young and old. But no women. Women, it seems, always come last. There is also an apparent correlation between the number of women in the speaker list and the number of women on the organising committee (ie usually 0-1 women on program committee and 0-1 invited women in speaker lists). Over the past three weeks, I have used variations of the following email to contact three symposia/conference organisers about imbalance in their meetings (a biology symposium with 4 white men invited speakers, a biophysics conference with 20 invited men, and a chemistry conference with 29 invited men and 1 invited woman). I am emailing on a delicate subject, relating to gender balance in the invited speaker list of the upcoming xxxxx conference. It seems from the information available on-line that all of the program committee, and all of the invited speakers are male. I am writing to ask you (1) to consider addressing this inequity and (2) to consider for future conferences adopting a public policy of inclusivity for invited speakers that is representative of the field generally. In case you are wondering, I found out about this imbalance through several people – men and women – who contacted me independently to express their concern. My paper in PLOS Comp Biol has become a manifesto of sorts to address this endemic issue – http://journals.plos.org/ploscompbiol/article?id=10.1371/journal.pcbi.1003903 Perhaps there might be some useful ideas there that could be adopted. I have pledged not to sponsor or support conferences (and don’t accept invitations to speak) unless there is a gender policy and evidence of good faith attempts at gender balance. Many other women and men have done the same. I wonder then, how the men invited to speak at this meeting will feel when they become aware that this seems to be a men-only invitation list. I wonder also, looking at the list, whether women will feel welcome to attend or participate in what looks to be a men-only event. This imbalance is particularly concerning at a time when academia is attempting to address gender inequity in STEMM. For the most part, the responses have been rapid and positive. I am thanked for my email, for raising the issues, for suggesting fixes. I am informed that committees are sorry for the dismay they have caused, that they too are concerned about the situation, and that they are doing everything they can to address the imbalance for this meeting and will adopt new policies in the future. Committees continue to get themselves into a pickle over this issue, raising the ire of their community, because they haven’t planned for balance and they haven’t implemented measures for unconscious bias. So while I still stand by my 10 original rules (1. collect the data, 2. develop a policy, 3. make the policy visible, 4. establish a balanced and informed program committee, 5. report the data, 6. build and use databases, 7. respond to resistance, 8. support women at meetings, 9. be family-friendly, 10. take the pledge) it’s now time to add a few more. Women more often than men – and for many reasons – will say no to an invitation to speak. If we don’t actively and deliberately plan to include women we will end up with imbalance. So, what to do? Actively and deliberately include women. Don’t invite women last. Invite them first. Draw up a long list of women speakers. Ask the relevant scientific community to suggest women speakers, use databases. Search granting agency awardee lists. Expect women to say no (and encourage them to attend the next year’s meeting if they can’t accept this time round). Move on down the list of women until the target number is reached. Then invite a few more. Only after that start inviting men. You won’t have any trouble reaching your target of men speakers. And even if you don’t, will it matter if once in a while there are more women than men invited speakers? It might be a small way to redress historic and recent imbalance. 12. When women speakers pull out, replace them with women or not at all. This is a no-brainer, yet time and time again last-minute speaker gaps are filled with men. Just. Don’t. Do. It. Gender balance won’t happen if no-one is accountable. Appoint a senior person on the program committee whose role it is to ensure (1) policies are in place, (2) everyone on the committee is aware of the policies, (3) data are reported publicly, and (4) the community is updated on the gender balance and how it is tracking. Give that person authority and accountability. Ask them to provide reports at every program committee meeting. In some cases, international program committees of major congresses are limited to selecting speakers from hundreds of suggestions they receive from their community or from dozens of sub-committees.The cognitive bias “science is male” is held by a majority of people, so we need everyone in the process to be thoughtful and considerate – to actively and intentionally consider women in the list of nominees. The over-arching program committee may have the goal of balance in mind, but they need their sub-committees to support that goal. The solution here is to require sub-committees to provide a balanced list of suggestions. For example, ask sub-committees to provide 6 suggestions – 3 women, 3 men. Ask individuals to provide 2 suggestions – 1 woman, 1 man. In this way a long list of potential speakers can be built up that is balanced from the beginning, and that gives the overarching committee the wriggle room to achieve gender balance overall. Educate people. Inform the community as to why we need change. And explain how to make change happen, using conscious and deliberate processes such as these rules. After all, we could all do with better balance in our world in 2017.